What is a CSA? CSA stands for Community Supported Agriculture, and being a part of a CSA represents a meaningful commitment to eating locally and supporting your neighborhood farmer. Buying a CSA share is like getting a subscription to a magazine; by paying a fee up-front, you get a weekly sack of vegetables based on what is in season at our farms. Joining a CSA is participating in a tiny local economy. Farming is a labor of love, but to ensure that our farms are financially viable, we rely on the guaranteed income that our CSA provides at the beginning of the season. Your membership fees help cover our springtime costs before the harvests begin. Your connection to our farms is also a connection to the environment where we all live. Bounties in your share will be based on the growing season that nature provides us. Having a CSA provides a safety net for farmers, in case one of the crops we depend on at market gets damaged or destroyed. Finally (and most importantly!) the CSA model creates community– each week you have the chance to hang out with the people who grow your food, and we get the pleasure of checking in with the people who eat what we grow. Backyard Farms CSA is an urban CSA. The food we provide to our members is grown right in the Armory and Olnyville neighborhoods. This food is hyper local! As urban farmers, we grow food in very limited space, and this changes the variety of vegetables that we provide for our members. At farms with more acreage, more plants, and more waste, a CSA can be a vehicle for unloading surpluses. Since we don’t have a lot of land, we don’t have significant surpluses! 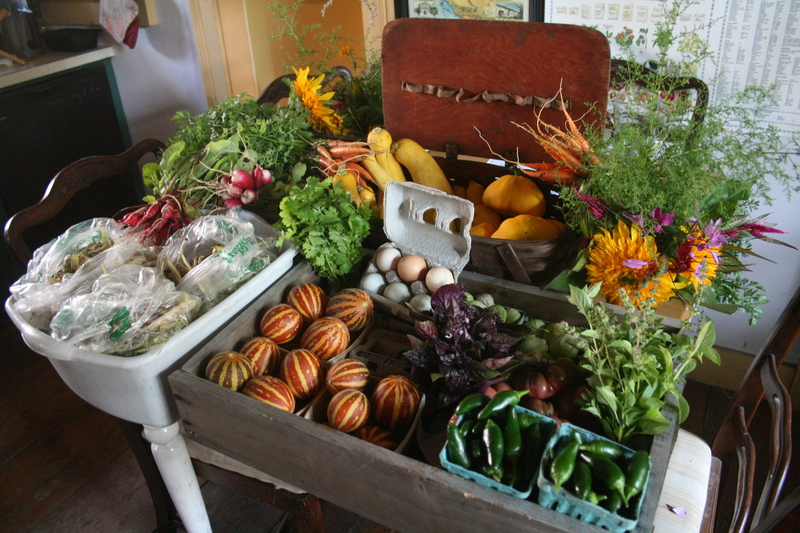 Providing for the weekly CSA share is a big part of our farm plan. We grow food for you. You truly will be a member of a farm community. Not only will our CSA provide members with a consistent supply of salad greens (the same mix they serve at the fanciest restaurants in town!) and herbs like in past years, but thanks to the addition of Florence and Manton Farm we will be able to offer you more summer favorites like slicing tomatoes, eggplants and peppers. Why grow veggies in vacant city lots? Urban farms are an investment in this city. Urban farms are beautiful. They reclaim abandoned spaces, make our neighborhoods safer through soil remediation projects, and attract bird, bees, and insects. Urban agriculture also promotes the local economy and creates local jobs. At the farmers markets, in CSAs, and through partnerships with restaurants, urban farms keep our food dollars in Providence. Urban farms have a low carbon footprint and a commitment to good land stewardship. Our scale makes heavy machinery unnecessary, and we don’t use petroleum-based chemical fertilizers or pesticides. Our food is grown in the neighborhoods where it is sold and we transport it by bicycle. Fewer food miles, fresher food! Buying into our CSA is buying into a vision of Providence as a fertile, beautiful, creative, and productive city.